This should appeal to superstitious Chinese and lovers of all things gold. A computer mouse which resembles a gold bullion is a revival of sorts since the first computer mice used to be brick-like gadgets which were cumbersome and non-user friendly. 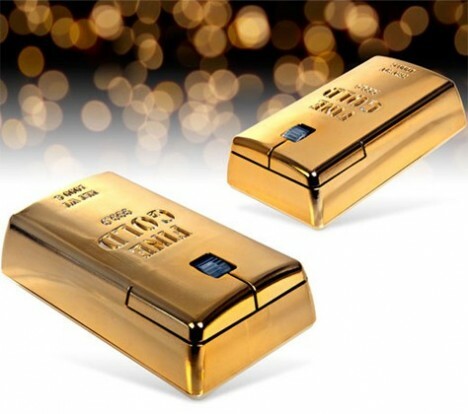 Naturally the Gold Bullion Wireless Mouse is by contrast high-tech and worth its weight in gold. Measuring 10.5 x 6 x 4 cm, the mouse comes with all the standard features of a mouse – right and left click buttons, a scroll button, plug-in via a USB port, PC and Mac compatibility. Elegant and glittering, it resembles a gold bullion in all appearances and is definitely the mouse to show off to match that new mean machine. But it is not ergonomically designed and is not too kind on the wrist and hands due to its shape. For $34.68, this may be one of the most expensive mice but the cheapest gold bullion you can lay your hands on.